This photo of my great grandmother would have been taken by her husband, my great grandpa Frank Duval. I think the composition and light are exceptional. 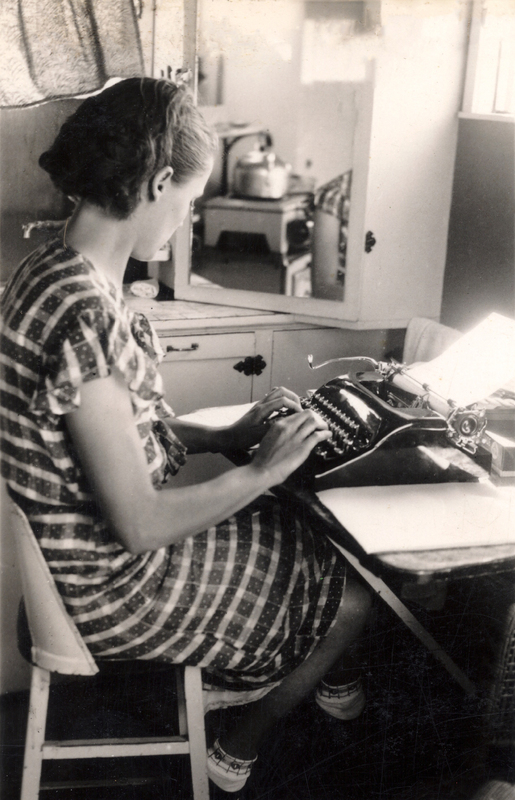 I love all of the fine details, her posture and clothing, the beautiful typewriter with a fresh sheet of paper, the angle of the mirror, the lines of her neck, arms, and legs. This may be one of my new favorites. Previous postTwo Infinity & Beyond! I love her socks!! This should go up on the wall where you do genealogy research – in one of those old frilly frames. Aaah, nice. You are right; this is a gorgeous and beautifully composed photo. Thanks Su. I am captivated by it. It’s a contact print. I wish it were larger so I could have a large shot to hang somewhere. Either way, I’m so grateful to have this little beauty.